I tasted this baby corn fry/baby corn 65 in a banquet. From then, I wanted to try it at home. Its a great starter recipe for lunch as well as dinner. Yesterday Raksha’s friends came home for lunch. So I prepared this fry along with veg fried rice, fruit custard and choco chip cookies. 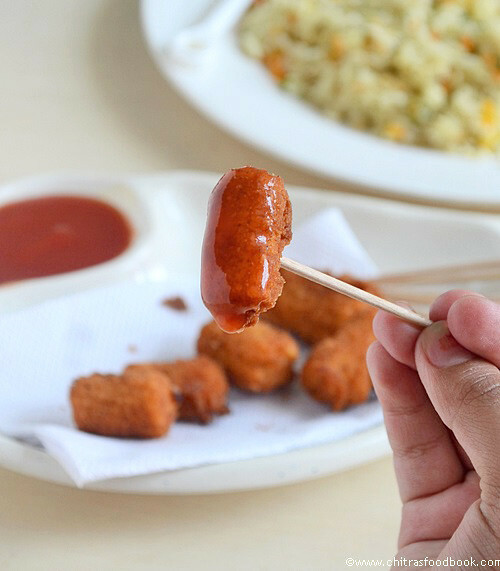 All the kids relished this fry with tomato sauce and there was not even a single piece left for us. It was very crispy, mildly spiced and the smell of masala was awesome. Everyone loved it. Do try this for your kids. U can make it as an evening snack too ! But one thing , you should eat it hot to enjoy its crispness and flavour!. Peel the baby corn and pressure cook it adding required water and salt.cook in high flame for 3-4 whistles.Remove chop into roundels and set aside. In a bowl,take the chopped baby corn and add all the powders given above.Lastly add a tbsp of curd.Mix well.Add little water to coat the baby corn with masala like bajji batter.Make sure the coating is not too thin or thick.Let it marinate for an hour. 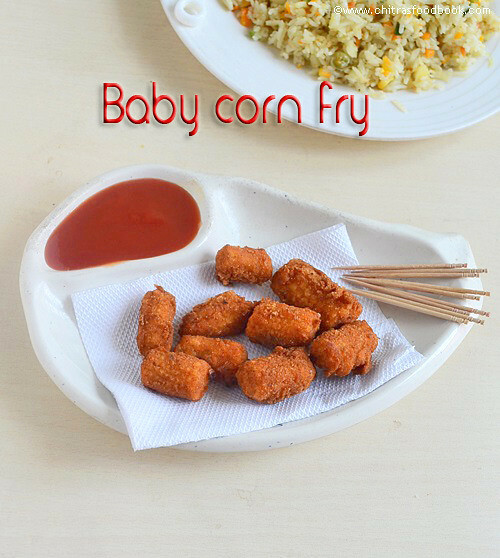 After one hour,take the baby corn pieces,dip in bread crumbs well and deep fry in hot oil. While deep frying,do in medium flame and make sure u do not flip the baby corn as soon as u put in oil.Let it be in oil for a minute.Then flip the other side and cook for one more minute.After it turns golden brown,remove and drain in a tissue. Serve hot with tomato sauce ! Instead of deep frying, u can shallow fry the pieces in dosa pan drizzling with oil.It will become a yummy low calorie snack. U can use lemon juice instead of curd. Bread crumbs are optional but it gives a crispy outer layer. 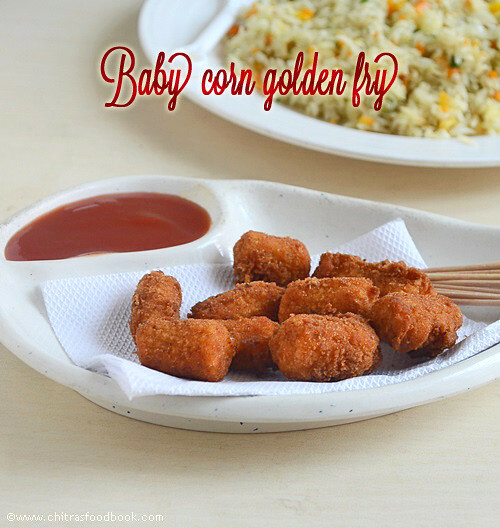 Enjoy this crispy baby corn golden fry dipping in tomato sauce.Tastes great ! Do check out my baby corn stir fry recipe with health benefits. Very tempting & mouth watering!! crispy baby corn fries, love it!! yummy snaks, very easy , i will try some time. i have joined ur beautifull space , would like to c u in my space too :) may i ? Umm.........What can u substitute for all purpose flour? Maida? I tried this recipe. It came out well but I used cornflakes powder instead of bread crumbs really it's very tasty and crispy.